The sneaker culture has always been all about making a statement and it is unbelievable how much the community is willing to continue the trend. We are now close to a future that demands subdued aesthetics. Old-school sneakers will never go out of style, but they have often been forgotten because they are just not visually exciting sneakers. These days, it is getting hard for sneakers lovers to find a casual everyday sneaker with a trendy appeal. Sometimes, you may make an instinct purchase, but be careful of spending money for something that is not worth it. Buying sneakers is not a cheap hobby. Next time you are about to buy a pair of sneakers; go ask yourselves whether they are worth the money or not. Russians believe that it is the clothes that offer a first impression of a stranger, signifying his or her social status, as well as emotional and psychological condition. Russian footwears also come into play in this matter. Even though the Russian sneakers culture is still in its infancy, distinctive features and signifiers are developing by the month. A couple of years ago, most people in Russia would choose classic shoes more than anything, while sneakers were exclusively used for sport. However, sneakers have now evolved into a separate subculture that exists on its own. Thanks to the modern chapter of sneaker culture that had successfully marked a key moment for sneaker culture becoming as popular as it is now. I have conducted my research of 7 best sneakers brands from Russia you need to know and compiled a list of my favorite styles and silhouettes for sneakers lovers. Outlaw Moscow is a Moscow-born fashion brand that has formed a band of fashion anarchists and given today’s generation in Russia a voice. They have made it their business to create unique streetwear designs that also represent their Russian heritage. They aspire to bring together the influences of their cultures and others around the world. The creation of PUMA x Outlaw Moscow is accordingly unique, eclectic, and complex, because they add the distinctive Russian design elements, Cyrillic alphabet branding, and graphic prints to the designs. All those aspects come together in a sneakers collection that is undoubtedly eye-catching, provocative, and complex. AFOUR is a particularly small apparel brand in Russia whose entire brand structure is built around creating custom shoes. Although they are small, their creations are a great reminder to everyone in just anywhere that there are pockets of the sneakers community that are constantly reinventing and growing and it is worth taking a look outside your windows to see what is going on the other side of the globe. AFOUR handcrafted sneakers codes are often classic silhouettes that consist of only clean lines and a laconic form of a specially designed pads and soles. Therefore, they will look great combined with any top, be it strict trousers, jeans or shorts. Two Balls is a legendary brand that has been producing a high-quality product ever since. Its glory lasted in 1960s and 1970s. However, recent publication claimed that some Russian designers have retained the original design of Two Balls and manufactured the sneakers in accordance with the Soviet standards. According to a press release, the sneakers have been remade up to the last detail, including the green soles and sewed logos. Beside its quality, Two Balls is also known as its ability to reflect the cultural heritage of Russia. They were invented more than forty years ago, in the golden years of the light industry. 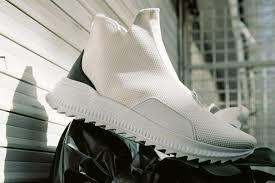 All.go is a casual Russian brand for footwears which was introduced to the market in the spring-summer season of 2014. At the start, the collections only consisted of summer, beach, and garden shoes made of EVA materials. But, in 2015 – 2017, All.go collection was dominated with sneakers, spring-autumn walking shoes, and winter boots which are produced with the use of EVA materials. All.go footwears were partially manufactured at the company’s factory in Novosibirsk. The All.go brand later developed as shop-in-shop format mostly being sold in other retail chains of the group. Kotofey is the most respectable brand of children and adolescent footwears in Russia. They produce little sneakers for kids so that they can go out in style, much like their adults. The brand establishes a work in conjunction with foreign designers to develop the brand’s product line. As in sneakers production, they implement the advanced production techniques, modern equipment, and the usage of quality raw materials so that they can enter the medium price range market of their little sneakers. VOID claims that their brand is a union of complex architectural forms and comfort, not tied to fashion trends through time. The brand itself was found back in 2012. At first, Egor of Noggin−the founder and creative Director of the brand−started working as a stylist for magazines and later was invited to the fashion house PIROSMANI conceptual clothing. VOID sneakers are made of the best Italian leather. Each pair is assembled by hand. Therefore, each piece is unique. Z!Boot sneakers are made exclusively by hand by a team of like-minded professionals in their field who pay their undivided attention to the word “shoes”. All their products are manufactured in St. Petersburg, Russia. They use the best quality materials and fittings, carefully working through the design of each model. It sounds like a long-await project. However, they are confident that their shoes will always be available for the majority of their customers. Take a look back that those 7 best sneakers brands from Russia you need to know above. Which one do you think stood out the most? Which one do you think worth the money? Please convey your views.